For quick help getting started with Amazon Chime, see below. For detailed help and training, please visit the help center. For IT administrators, please see the Administration Guide here. Download and install an Amazon Chime client or get started with the Amazon Chime web app. Launch the app and choose Sign in / Sign up and enter your work email address. Select Create a new Amazon account. Provide your name, your work email address, set a strong password and select Create your Amazon account. Grant access for your Amazon account to be used with Amazon Chime by choosing I agree. Check your email and choose “Verify Me”. Enter the characters presented to complete the verification. Go to http://chime.aws/trial for information about downloading Amazon Chime for your other devices. Sign in using your new account and your devices will be synced. Select New Contact… from the File menu. Enter the email address of a colleague you would like to collaborate with in the field provided. If a user has already created an Amazon Chime account using that email address, they will be added to your contacts immediately. View all your contacts by choosing Contacts on the launch pad. Start a Chat by selecting Message from the launch pad. Start entering the user’s name and then choose it from the auto complete list. Enter more names if you would like to start a group chat. 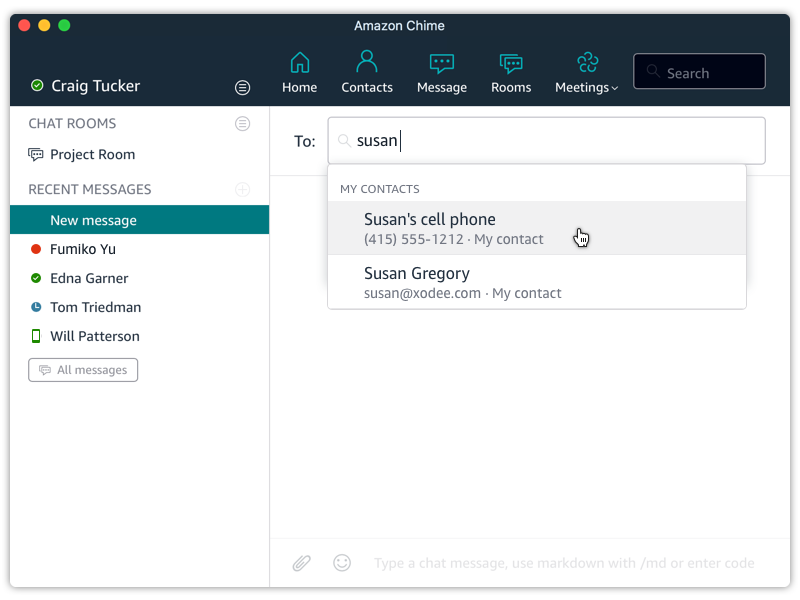 Amazon Chime Chat features include read and delivery receipts, file attachments, emojis and emoticons, search, persistent chat threads across all your devices and adjust font size with Ctrl and +, Ctrl and - and Ctrl and 0. Move quickly from a Chat to a Call. One user initiates the Call by choosing the phone icon. The other user receives the Call and selects Answer to join. Select Start Webcam or Video to enable your camera. Open the Visual Roster by clicking << on the far right edge of the window. Use the Meeting Chat to share ideas, files and images. When you attend larger meetings, the Visual Roster provides attendee status including who is present, running late (and when they are expected to join), invited, left, dropped and declined. The Audio Icon shows dial-in or in-app audio and bounces when sound is picked up. Click an Audio Icon to mute another attendee who is adding unwanted sound. Access other Meeting Controls to add attendees, copy meeting information to invite others or leave the call. View screen share, video, meeting chat and the roster. 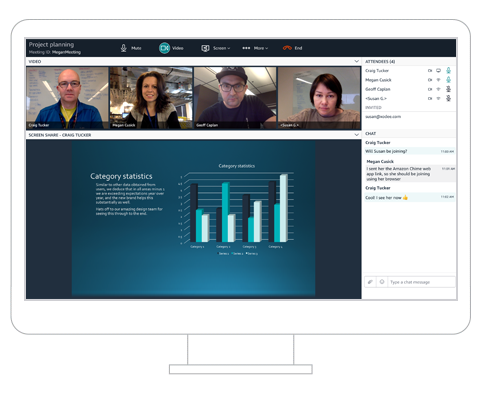 Amazon Chime provides video, screen share, recording and other features during Scheduled and Instant Meetings. Call Controls are accessed under the More menu, on the Launch Pad (across the top of the window) and in the Visual Roster. You can mute yourself or others by clicking on the Audio Icon, toggle video on and off or pop video out to a new window, share your display or window by choosing Screen and making a selection, and use Meeting Chat to communicate with all attendees and share files. Choose the Meeting ID drop down to get meeting instructions or to copy the meeting link to send to attendees that are not using the Amazon Chime app. Organizer Controls are found under the More menu and include record meeting, lock meeting, and event mode. You can also add presenters from the More menu to grant permissions to other attendees. Don't worry, if you don’t have the Amazon Chime app installed on your device, you can still join meetings in your web browser using the Chime Web Application. Start by choosing the link that is included in the meeting invite. Provide the name to include on the Visual Roster and choose Next. 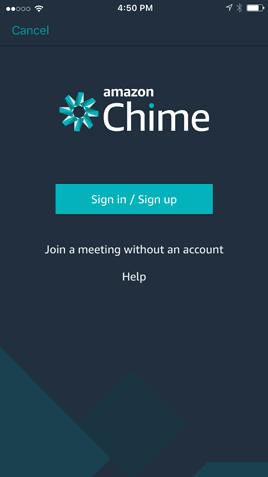 Please see the Chime documentation for more information on how to join a meeting without the Chime app. Once Amazon Chime Business Calling and the outbound calling feature are enabled by your administrator, you can make outbound phone calls from any Amazon Chime application. 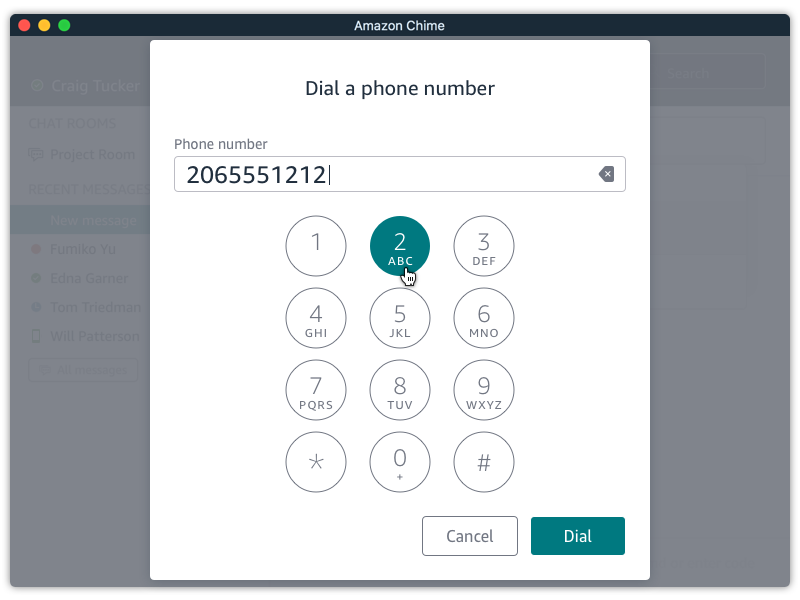 From the Amazon Chime desktop or web client Home page, choose Dial a phone number. For Phone number, enter the country code and phone number without any dashes. For example, +12065550100. When the person you called answers their phone, an instant meeting opens in Amazon Chime. As the meeting host, you can choose More to invite others to the call, or to change your meeting settings. For more information, see Host a Meeting. Once Amazon Chime Business Calling and the texting feature are enabled by your administrator, you can send a text message to a phone number. To send a text message to a phone number. From the Amazon Chime client, choose Message. o For a new phone number contact, enter the country code and phone number to call, without any dashes. For example, +12065550100. Choose create a new contact. o For an existing phone number contact, search for and select the existing contact. 2. Enter your message and press Enter to send. Once the Amazon Chime desktop app pops up, claim your personalized meeting link on the upper left of the window under your name and email! You can use your personalized meeting link to start instant meetings, and to make it easier for your participants to join. Your meeting link will be included in the meeting request when you invite people to scheduled meetings. Choose your default audio and video devices you would like Amazon Chime to use for meetings and instant calls. These settings are retained when you exit the Amazon Chime app. They are reset if you Sign Out. On OSX, select Preferences from the Amazon Chime menu and navigate to the Audio and Video tabs. On Windows select Settings from the File menu and navigate to the Audio and Video tabs. 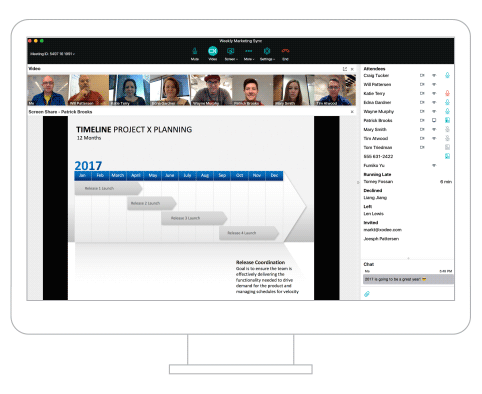 The Amazon Chime Add-In for Outlook enables Amazon Chime Pro users to include Amazon Chime meeting details in meetings scheduled for themselves or others, without leaving Outlook. There are two versions of the Amazon Chime Add-In available. The Amazon Chime Add-In for Outlook works on recent versions of Microsoft Outlook and Exchange, including Office 365. The Amazon Chime Add-In for Outlook on Windows provides the same scheduling functionality and is compatible with older versions of Outlook and Exchange, but only works on Windows. 1. Decide which Outlook Add-In is right for you.